Private hot tub, mountain views, pool table in the loft! Plan the ideal Southern California family vacation when you book a stay at this three-bedroom Big Bear Lake vacation rental. 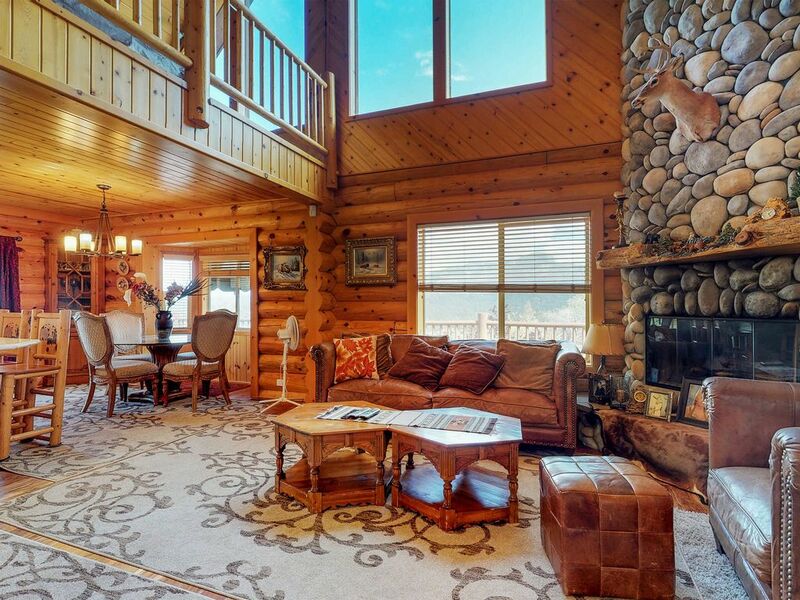 Perfect for up to a maximum of eight guests, this wonderfully updated log cabin is packed with amenities like a private hot tub, mountain views, and a cozy river rock, wood-burning fireplace. The highly-desirable hilltop neighborhood of Castle Glen Estates offers a central Big Bear Lake location for skiing, with both Snow Summit Ski Resort and Bear Mountain Resort within a five-mile drive. In summertime, relax by the lake, rent a boat, or just enjoy the lovely water views - you can walk to the shore in about 20 minutes. This family-friendly retreat is stocked with amenities to make your stay enjoyable. You'll have a pool table up in the loft, cable TV, a DVD player, WiFi, a washer and dryer, and of course, the outdoor hot tub! There is a full kitchen for preparing meals, with extra gadgets like a blender and a slow cooker. And right outside, there's a gas grill for cookouts. Visit this region all four seasons for fun activities, whether it's winter skiing and snowshoeing, hiking through spring wildflowers, leaf-peeping in the fall, or swimming in the summer! This Big Bear Lake escape in the scenic San Bernardino National Forest offers great amenities and a comfortable home away from home for your whole group! Parking Notes: There is a rise in the driveway at the entrance that may cause vehicles with standard ground clearance or a longer wheelbase to drag the bottom of the car. Please use caution when entering the driveway. During winter season (Nov 1st thru April 30th) 4 wheel drive and/or chains/traction devices may be required to reach the cabin and to park in driveway. Snow and ice can accumulate quickly, use care when walking and driving. Vacasa will clear snow from driveway and walkways - but only after streets are plowed by the city and snow has ceased accumulating on the ground. Street parking is illegal during the winter season and cars parked on the street will be cited by law enforcement ($150.00 fine) and towed at vehicle owners expense (fees vary by towing company) - Vacasa accepts no liability/responsibility for fines and/or costs incurred by guests for violating city parking restrictions. Water Access: Pine Knot Marina is 3.5 miles (approx. 10 minute drive) from house. Pine Knot Marina offers The Miss Liberty Paddle Wheel Boat tour of the lake and Rentals: Pontoon Boats, Kayaks, Fishing Boats, Fishing rods, bait shop, Stand-up Paddle Boards and Jet skis. Bear Mountain Resort is 3.6 miles (approx 11 minute drive) from the house & Snow Summit Ski Resort is 2.6 miles (approx 9 minute drive) from the house. It was an enjoyable stay.....but. Guest rooms are spacious and well appointed. Kitchen amenities (pots, pans and cutlery) are terrible. Should be embarrassed. Cutlery is worse than a high school cafeteria. Not to the standard of what should be provided in a rental of this price. Pans with the teflon either peeling off or non existent. Handles falling off. Seat covers on the four chairs at the main dining area are filthy and need to be recovered. We had to cover them with towels they were that bad. We paid for a "hot tub fee" the hot tub was padlocked. Two texts to the manger "Shelby" went unanswered. There was no to access to the hot tub due to recent snowfall and no shovel service. The pool table is nowhere close to level and the legs are wobbly which is a major hazzard. I truly wish I could give this a better review but there were major issues. If you plan to utilize the kitchen for meals rather than take away or local restaurants you will have rather large challenges. We agree that the view is amazing, Steven. The pool table is secured and is not meant to be leaned on. The code for the spa is provided to guests in the online trip portal. The cloth on the dining chairs have been cleaned and the pot and pans have been replaced. We appreciate the feedback and we hope to host you again soon! We loved the view, amenities, size of the house, décor kitchen space, bedrooms, proximity to entertainment, etc. My Family and my brothers family were very disappointed with this property. Not only the driveway, the deck all around the house were covered in snow, almost a foot high but the stairs leading down from the driveway to the property was so icy that 2 people slipped multiple times as we were going back and forth taking stuff from the car to the property. After calling the management company, they told us that it was plowed the day before but they'll send someone out there again. As the work crew showed up they told us that they only plowed the street, NOT THE DRIVEWAY, NOT THE STAIRS AND FOR SURE NOT AROUND THE HOUSE ON THE DECK!!. We had a hard time opening the door because the combination given to us was the wrong code. we had to stay out there for about 20 minutes before we can get a call back with the correct code. Upon entering the property, there were holes on the dinning room chairs, the sinks in the bathrooms were NOT draining at all. One of the working crew guys had to pour in "liquid Fire" to open up the clogged sinks. The bedrooms were a mess, the blankets and pillows were all over the place. There were 2 wifi passwords and neither one worked. The barbeque was on a different level than our deck - it was behind the garage by the inaccessible spa. You had to access the garage, the spa and the bbq area by going up the stairs again and through the driveway. The codes for the garage and the spa that were provided did NOT even work. We had to buy a new grill from Vons down the street to do our bbq. we called corporate and they told us someone will be there within an hour to inspect the property, however, we were there fro 2 days and NOT a single person showed up. I have pictures to show all of these if anyone is interested to view. Bottom line, I would NOT ever go back to the property and I would NEVER recommend this property to friends or family.!!! We are sorry for the inconveniences you had. We are not sure what work crew you're referring to as our vendors do not plow the street. We hope to correct all of these mistakes and would like to see you stay again with a much more enjoyable trip. Thank you! We had a wonderful time at the mountain house. Quite nice and very comfortable. Thank you again. great place, beautiful view, can't wait to book again next year!